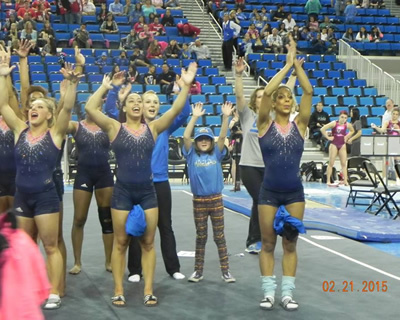 Parkers MVP Celebration with UCLA Gymnastics - Cancer Fit Inc.
Parker was the guest of honor during the UCLA Gymnastics Pink Meet. The team welcomed her on the floor during warm-ups and for the the competition. Parker also was introduced to the crowd at the nights MVP and led the UCLA 8 clap cheer.